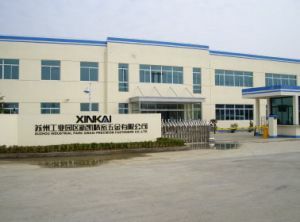 Suzhou Industrial Park Xinkai Precision Fasteners Co., Ltd was founded in 2003, specialized in the R & D, manufacture and sale of all types of fasteners, with an area of 20,000 square meters. Company is in possession of the advanced production and test equipments. Our products cover self-clinching fasteners, DIN, JIS, ANSI, GB, BS standard fasteners and various customized components ,also, we design and produce special fasteners for customer. These products are widely used in Telecommunications, Automotive, Railway, Electrics, Medical, Aerospace and other industries. As an agency of many world-famous brands such as Southco, EMKA, Accuride, LAMP, Haeger, we are capable to provide the world-class access solutions for fastening systems and product systems. The company has passed ISO9001: 2000, TS16949, ISO14000 system certification. And we will be dedicated to providing our customers with superior products and better services by continuous improvement.